What makes our decorative concrete floor coatings the best? That's simple. Our concrete floor coatings are made right here in the USA. We manfuacture and produce all of our own products, thus cutting out an un-needed middleman allowing us to lower our prices. Our prices are so low many of our competitors have had to lower their prices just to compete and are still at a disadvantage. Our pioneered polyaspartic concrete coating is currently the best concrete coating for the garage and commercial applications. We also offer epoxy and acrylic coatings however polyaspartic/polyurea chemistry is far superior. Our polyaspartic floor coating chemistry is so unique that we've create a product that is up to 4x stronger than epoxy and more abrasion resistant! Boasting excellent chemical resistance our polyaspartic coating has garnered some of the best reviews in the industry. Whether you're looking for a simple garage floor coating at home or a commercial scale warehouse, kitchen, or restaurant. Our products are some of the best in the industry. We are happy to work with you to provide a flawless floor for whatever your circumstances are. Our polyaspartic and epoxy coatings are capable of holding chips or flakes as well as sand or grit, they are also available in solid color pigments or custom colors, as well as our specialized metallic pigments. Our metallic pigments are very unique and give any floor a sparkle that's sure to impress. Looking to create an amazing garage? 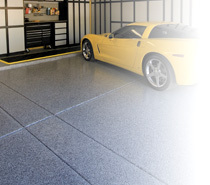 Our garage floor coatings go extremely well paired with our line of storage products. Get organized today! Don't let a cluttered garage, storage basement, or messy closet stop you. Call us today for professional help designing a custom storage solution for your storage needs. For the refined looks of a finished home, garage, basement, closet, or kitchen, let us help you get the best quality products in your home at the best possible prices. Our modular designed and patented dove-tail joint design makes our cabinets unique and easy to assemble and install anywhere in the home. The modular design of our plywood storage cabinets make our cabinets easy to mix and match for any storage needs. If you want to build a little storage now, and add more storage cabinets later, that's no problem! Our cabinets will mix and match accordingly and are easy to mount together for seamless looks. If it's durability and quality you're after, then look no further! Our plywood cabinets outlast and out-perform our competitors cheaper and inferior particle board cabinets. Particle board is not the same as quality plywood. Particle board will chip, deteriorate, and not last as long as plywood cabinets. Not to mention, if you get particle board wet or in a moist or damp environment it will sag and fall apart on itself effortlessly. Whereas plywood is much stronger, made of sheets, and some of the most durable materials to use in cabinets and home furnishings. For questions, comments, or your Free Estimate, please call us today at 800-835-1759. We can get your storage project started started today! For our Sitemap/Link directory please click here.